Jocelyn Bloom is known as the “Life Coach to the Stars” but never expected she'd become entangled in a scandal as the “other woman.” The press is hot on her tail, so she heads to the last place she hopes they don't expect her to be, Barefoot Bay, where she spent her childhood but has barely set foot on since. Jocelyn's friend, Lacey, is building a new resort there and invites her to stay in one of the villas. However, Jocelyn isn't aware that her childhood friend (and former pro baseball player) Will Palmer is working at the resort. It doesn't take long for them to run into each other, and for Jocelyn to learn that Will is watching over her father, Guy, who now has Alzheimer's. The two people from her past that she'd rather forget about are now a big part of each other's lives. Will's life is on hold while he hopes a team will call him with a coaching job, so he's working at the resort. He lives next door to Guy and has watched the man slowly deteriorate from the belligerent cop who threatened him when he discovered Will and Jocelyn in a compromising position. While he somewhat understands Jocelyn's reluctance to come back to Barefoot Bay after all these years, he can't understand why she won't take pity on her father now. But when Guy mistakes Jocelyn for a television hostess of a show he watches, she's suddenly pulled into Guy's life once more, as well as being around Will. Will is aware of the scandal involving Jocelyn and doesn't believe the stories, yet he can't understand why she won't face the press to deny the charges. Both Will and Jocelyn have to deal with their demons, but how can they if they won't open up to each other? A return to Mimosa Key Island and Barefoot Bay wasn't in the plans for Jocelyn in BAREFOOT IN THE RAIN. She's successful in her career and pushed her abusive father into the past, as well as her blissful memories of Will that turned into a nightmare the night they got caught about to do the “act” by her father. But she's now being pursued by the tabloids as Hollywood's Golden Couple is facing a marriage crisis—with Jocelyn named as the mistress. An SOS call has Jocelyn's friends, Lacey, Zoe and Tessa, banding together to help her. Jocelyn had hoped to stay away from Guy, but running into Will puts her on the spot. Is the father she once loved and then hated really ill with Alzheimer's? Then there is Will…she loved him and wanted him, but on that fateful day years ago, everything changed. She doesn't want to relive the past, even as it becomes clear she needs to open up and tell Will the whole truth. Will should hate Guy, but when he returned to Mimosa Key after his pro career fizzled, the old man was already fading fast. In his confused state, Guy thinks Will is his son, and oddly, Will lets him. Guy can't remember Jocelyn and mistakes her for a member of the Clean House television series, thinking she is there to organize his house. Jocelyn and Will don't have the heart to tell him the truth, because it allows her a chance to see her father up close. How can a man who terrorized her late mother turn into a pussycat who now does needlecraft? Will wants Jocelyn to face her past and deal with the fact that Guy is ill. She just wants to dump the old man in a retirement home. Then there is the scandal that brought Jocelyn back…why won't she discuss the truth with Will even though she denies she's a home wrecker? What—or whom—is she protecting? 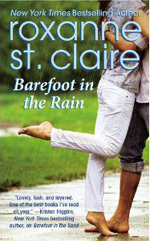 Roxanne St. Claire has penned a stunning tale with BAREFOOT IN THE RAIN, and one that I found hard to put down. There are childhood best friends Jocelyn and Will, both shaped by the past with a lot of unfinished business between them. Guy may have been an ogre years ago, but the disease has reduced his memory to that of a child. Jocelyn's friends, Lacey, Zoe and Tessa, will do anything for her, yet even they don't know of her past, except that Will apparently is the one she can't forget. The Barefoot Bay series is about the four ladies, and Lacey's book, BAREFOOT IN THE SAND, is already out and ties in with this tale. Jocelyn's secrets are held tight inside her even though readers will likely figure out the truth. Her steadfast vow to not betray her friends, and how she eventually reconnects with Will is a big part of BAREFOOT IN THE RAIN. A page turner from the start, there is rarely a dull moment to be found and is the reason why BAREFOOT IN THE RAIN well deserves a Perfect 10 from Romance Reviews Today. Get to know Jocelyn, Will, and everyone else by picking this up and discovering why BAREFOOT IN THE RAIN is a book not to be missed this month. Congrats to flchen1-- she wins the copy of The Christmas Catch by Ginny Baird!! Q & A with Cate Lord!!! The heroine, Jessica Devlin, is twenty-nine, single, and a beauty editor for the Orlando-based magazine O Tart. She’s also heartbroken after finding out that her fiancé slept with another woman just months before he and Jess were to be married. Feeling like the universe is against her, Jess’s self-confidence is practically non-existent. So is her love life. Overdue for a vacation, Jess flies to England to be maid-of-honor in her cousin’s wedding. Jess is nervous about the trip, and not just because her cousin’s getting the fairy tale happily-ever-after Jess wanted. There’s also the embarrassing incident that happened two years ago after Jess’s grandfather’s funeral; it involved an English pub, too many drinks, an overflowing of grief for her grandfather, and a handsome stranger who comforted her while she bawled. That man was Nick Mondinello. Jess figures there’s no chance of running into Nick again. She sets herself a vacation mission: to have a great time for a gal who’s single and on the cusp of turning the big 3-0. Then, she steps into the English church on the wedding day and recognizes the best man: Nick. Jess resolves to avoid him. However, she can’t ignore that he’s one gorgeous, intriguing Brit. Moreover, fate keeps throwing them together. Nick wouldn’t possibly be interested in her, would he? There were a lot of favorite scenes for me. However, I think my all-time favorite is the last one in the book—where finally, all of the good things that Jess deserves arrive on her doorstep. Literally. J I won’t say any more because I don’t want to spoil the surprise for my readers. 3. What was one of the most surprising things you learned in creating your story? I love all of the characters I’ve created in my books, but as I wrote further into Lucky Girl, I learned just how much I adored Jess. She was always very real to me, even when the idea of the book was just a few rough scenes in my mind. However, through writing her story, she became like a best friend. I laughed with her, got angry with her, cried with her… I guess you could call her an imaginary BFF. I have a fantastic critique group; they’ve been part of my writing life for many years. My cp’s read chapters for me and give suggestions; they are fabulous writers themselves, and always give excellent feedback. It’s incredibly helpful to have people who aren’t as close to the story read it and point out where I need to flesh things out. My writing is better because of them. My family is incredibly supportive. My parents are very proud and give copies of my books to friends and associates. My husband and daughter have accompanied me to talks I’ve given at libraries and conferences, and they are wonderful at celebrating my good news—such as my recent first place win for Lucky Girl in the contemporary single title category of 2012 Heart of Excellence Readers’ Choice Awards. Personally, I will never turn down a chance at a nice dinner out with my family. I love to bake and cook; I have a huge stack of recipes I’ve torn out of magazines that I want to make, and I’m lucky in that my family is always willing to taste something new. I also enjoy morning walks on the local nature trail, gardening (I do love fresh, home grown tomatoes), shopping at my favorite mall with my daughter, reading, browsing antique stores, having lunch with my friends, and lazy evenings with my family watching episodes of Warehouse 13, Once Upon a Time, Cake Boss, and Monk. Thanks so much to Romance Reviews Today for the fun interview! Jessica Devlin isn’t looking for love. Heartbroken after being dumped by her unfaithful ex-fiancé, she’s determined to have a fabulous time during her vacation in England where she’ll be maid-of-honor at her cousin’s wedding. After working overtime as beauty editor of Orlando’s O Tart magazine, avoiding dating, and putting on ten pounds, Jess is ready to toss her past like an empty lipstick tube and party like a single gal. But when she steps into the church on her cousin’s wedding day, she sees the one man who could sabotage her plan—James-Bond-gorgeous Nick Mondinello. She’s never forgotten the London marketing exec who held her in his arms after her beloved grandfather’s funeral two years ago. Ambitious, and lusted after by women everywhere, Nick is completely wrong for guarded, Plain Jane Jess. Could Spy Man Nick ever fall for her? Nope. Not unless Jess is one lucky girl. Chat Wed night with... Leigh Duncan! Notes: Harlequin American Romance author Leigh Duncan joins us to discuss her book, RANCHER'S SON. Door prize: One lucky winner will receive an autographed copy of RANCHER'S SON, and another winner will receive, from Leigh's backlist, their choice of either The Officer's Girl, The Daddy Catch or Rodeo Daughter (an RT Top Pick! this June)! All winners must have USA or Canada addresses. Moderated by Sandi. Q & A with Loucinda McGary...and a contest!! Thank you for having me as a guest on your blog today. I'm excited to be here and talk about my newest ebook release! His Reluctant Bodyguard is the second book in my Adventure Cruise Line series. This book and my previous one, High Seas Deception are romantic suspense/thrillers set (at least partially) on fictitious cruise ships. I love cruising and thought readers might enjoy stories that use a cruise as a backdrop. This is a reunion story, which I've never written before. The heroine, Avery Knox and the hero, Rip Pollendene knew each other in college ten years before His Reluctant Bodyguard opens. Neither of them ever acted on their attraction and they both regretted it. Fate seems to have thrown them back together, only to tear them apart. Rip has been summoned back to his birthplace, the Caribbean island of Benezet, which is on the brink of a civil war. Avery has just started her new assignment as cruise director of the Valiant, and has familial responsibilities of her own. But the two of them can't deny the potent allure of the other. Nor can they ignore the fact that someone is out to kill Rip! I learned that voodoo is still common in the Caribbean islands. I also learned that I have more difficulty coming up with French names than Celtic names. Deciding on names for secondary characters in His Reluctant Bodyguard was a real challenge for me. Since I was nine years old, before that, I printed. But seriously, I started writing stories as a kid. However, I did not take my writing seriously until many years later. Finally, at the end of 2003, I quit my day job to pursue my dream of writing and publishing novels. My first sale to a publisher happened four years later in Sept. 2007, though the book wasn’t released until Oct. 2008. 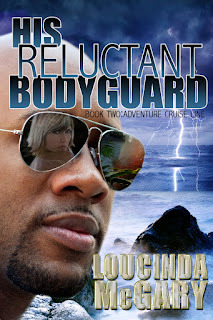 His Reluctant Bodyguard is my 5th published novel and 6th published work. When I sold and released my first novel (The Wild Sight) back in 2007 and 2008, most of my friends and acquaintances were quite surprised. Very few people outside my immediate family knew that I wrote anything besides memos and business letters. As for authors, some of my early favorites were Phyllis A. Whitney, Victoria Holt, and Mary Stewart. Reading their books instilled my love of romantic suspense. I also loved Terry Brooks’ early work (the Sword of Shannara Series), and it inspired me to add elements of fantasy in my work. I was also (and still am) a huge fan of Diana Gabaldon’s Outlander series. My DH and son are very supportive even though neither of them read fiction. They have both talked my books up to co-workers and friends, and helped me with speaking engagements and book signings. Several of my nieces and even a couple of their husbands have enthusiastically read my books. I have actually named characters after several of them. My other great passion is travel. My DH and I have thus far visited 47 of the 50 states, and been to 34 foreign countries. We’ve been to Europe, Asia, Central America, Australia and New Zealand. Technically, we were also on the African continent once when we took a day trip to Morocco, and we’ve been close enough to see South America (Venezuela) though we haven’t set foot there yet. As for other hobbies, besides reading, I like to knit and crochet. I like to make simple projects like scarves and lap robes/baby blankets. 7. How can readers connect with you online? I also have an author page on FaceBook: www.facebook.com/loucinda.mcgary You can “like” me and leave a comment on my wall. I LOVE to hear from readers! Please stop by and say hi. Today, I am giving away a free download (either Kindle or Nook) of His Reluctant Bodyguard to one randomly selected commenter. Plus, everyone who comments will be in a drawing for a $20 gift card which will be given away at the end of my blog tour (Dec.5th). The last person cruise director Avery Knox expected to see aboard her very first trip out on Valiant is former college football star, Rip Pollendene. A decade ago, she had turned down his advances at the University of Miami and lived to regret her decision. Why is she so reluctant to take the second chance she’s been handed? Rip Pollendene is the heir apparent to a beautiful island nation. But it’s a heritage Rip has ignored and rejected for twenty years. Now his homeland is on the brink of a bloody civil war with outside forces trying to manipulate the outcome. Is that why someone wants him dead? How much should Rip sacrifice for a country he hardly knows? And is it sheer coincidence that has thrown golden girl Avery Knox back into his life? Can they stay alive long enough to find out if their love really is meant to be? Blessed with the gift of “Irish Blarney” Loucinda McGary (everyone calls her Cindy) became a storyteller shortly after she learned to read. If she didn’t like the way a story ended, she made up her own ending. A long-time reader of romances, Cindy discovered and joined Romance Writers of America in 2001. But her stressful career as the manager of a multi-million dollar State and Federally funded program prevented her from doing much writing or traveling. She still managed to squeeze in a little of both, but not enough of either to be truly satisfying. Finally, at the end of 2003 she decided to take an early retirement from her career to fully pursue her twin passions of travel and writing. On Sept. 14, 2007 Cindy received “the call” from an editor that changed her life, and she sold her first book (actually the third book she’d written since she left her job four years earlier). The Wild Sight was released Oct. 2008 and received a rare and coveted starred review from Publishers Weekly magazine. It also went on to win the “Best First Book” category in the More Than Magic contest. In 2010, the electronic version of Wild Sight became an Amazon bestseller in their Top 100 of all books. In Sept. 2009, her second published novel, The Treasures of Venice was released. This story previously finaled in the prestigious Golden Heart contest in 2006 under the title Jewels of the Madonna. Treasures of Venice went on to win the Judge a Book By Its Cover contest and to final in several other regional contests. In July 2010 her third traditionally published novel, The Wild Irish Sea was released, and received a four star review from Romantic Times Book Review magazine. Cindy likes to set her novels of romance and suspense in some of the fascinating places she has visited. To date, she has visited 47 states and 32 foreign countries. Chat Wednesday night with Kaitlin O'Riley! Q & A with Elizabeth Lennox!! Win a $15 Amazon or BN gift card! Chat Wed night with Nancy Herkness! Q&A with Rick R. Reed and a giveaway! Wed night chat with...CATHY MAXWELL! Q & A with Victoria Alexander!! Q & A with Jillian Stone!